Eric was born in Manhattan, Kansas, in 1964, and by 1969 his family had settled in Amherst, Massachusetts, after residing in Wisconsin for three years. Growing up in Amherst he began collecting plates at age 11 when he saved his father's Kansas and Wisconsin plates after nobody bought them at a family yard sale in 1976. He received his ALPCA membership as a Christmas present in 1979 and has been active in the hobby ever since. Eric has given of himself to ALPCA and its members throughout the term of his membership. Relatively early in his tenure he co-hosted regional meets, wrote numerous articles for the club publication as well as a column entitled "Winning Numbers" from 1992-2002, and served twice as a director for two-year terms in the late 1990s and early 2000s. He was recognized in 1997 with the Long Island Region Award for outstanding contributions to our hobby. 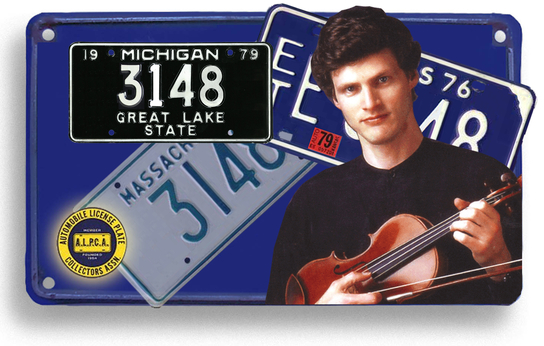 Upon its 1995 publication, License Plate County Codes of the United States and Canada, co-authored with Tom Boyd and Bill Davis, was a sign of things to come from Eric. Thirty-seven years into his membership Eric has indelibly made his mark on our hobby with his groundbreaking research and corresponding detailed documentation of U.S. and Canada license plate physical characteristics, numbering systems, and registration programs. Building on a foundation laid by earlier members with similar interests, and combining the exploitation of new technology with old-fashioned methods, Eric has unselfishly devoted countless hours to uncovering forgotten information. Were Eric not to have developed a deep understanding of vehicle registration systems, registration historians would not have identified, interpreted, or properly placed into context, many of the irregularities found in state allocation systems. Any book on the subject of U.S. and Canada license plate history without Eric's name in the acknowledgments is almost certainly incomplete. In what was a natural role for him, Eric served as club archivist from 2009 through 2014. Much of his personal research is posted online for all to use and benefit from freely. License plates are only one part of Eric's life. He is the principal second violin for the Grand Rapids, Michigan symphony orchestra. He studied at the Eastman School of Music in Rochester, NY and holds a Master's degree in music from the University of Massachusetts in Amherst and the Manhattan School of Music in New York City. Eric appears at several summer music festivals around the country and performs with the Perugino String quartet in Michigan. Eric is married to professional cellist Stacey Bosman Tanner and they reside in Grand Rapids, Michigan with their two daughters. It is with great pleasure that we welcome this most thoughtful, generous, and knowledgeable license plate collector and historian to the ALPCA Hall of Fame.